Who says you can’t have sweets for breakfast? Most breakfast food qualifies as dessert, anyway, plus you have all day to work it off. And, now that everyone’s throwing all kinds of stuff into the waffle iron…pizza, brownies, cookie dough, even tater tots…we’re making Churro Waffles. Pâte à choux dough scented with Mexican vanilla fresh out of the fryer makes that crispy, cinnamon-sugar exterior giving way to a warm, spongy interior we all know and all. The words pâte à choux used to scare the bejesus out of me. There was the Great Cream Puff Disaster of 2005, when I worked hard in Mom’s kitchen and failed both her and my friend Silva’s recipes. My puffs flopped as soon as they popped out of the oven. Then, in 2014, I had my first (and last) attempt at making eclairs for Dad’s birthday. They were sad, sad looking, inedible thingies. But, I’m not scared, anymore, and neither are you. 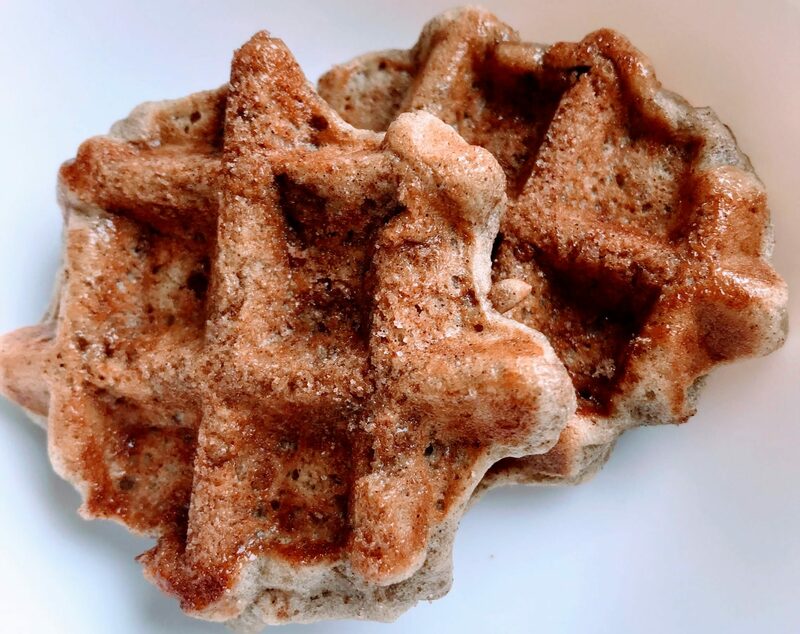 Today, I made three batches of these irresistible churro waffles. I took some next door to my friend’s house and her son couldn’t stop eating them. That’s where I heard that the famed Mexican treat is actually from Spain, made with a thinner batter and unforgettable taste. Maybe the butter came from happy cows roaming the lush Spanish countryside. Maybe the flour comes from organic wheat fields. Maybe everything tastes better on vacation. Homemade churros are amazing, baked instead of deep-fried, so, technically, they’re healthier than the stuff you get at the amusement park. The dough is essentially the same as that for eclairs and profiteroles and, with this no-fail recipe is sure to impress. Now, to give your waffles a proper Belgian accent, sprinkle some pearl sugar over the batter just before closing the waffle iron lid, like they do in Liège. Don’t go spending money, looking for pearl sugar. Make your own. All you need are some sugar cubes and a meat mallet. Hard-pressed sugar works best because it melts slower, but good old Domino will do just fine. The sugar melts and caramelizes under the hot metal, creating a crispy coating over the dough. Set a large pot over medium-high heat and bring butter, water, salt and cinnamon to a boil. Add flour and whisk til smooth. Remove from heat and add eggs, one at a time, whisking well after each addition. Let the dough rest 5 mins. In a small bowl, mix the cinnamon and sugar for the topping. Drop 2 tablespoons of batter into the center of each waffle well. Sprinkle cinnamon-sugar over the batter in each well. Close lid, flip the waffle iron upside-down and cook until golden brown, 5 to 10 mins. Dust with more cinnamon-sugar and keep warm. Serve warm with a scoop of espresso ice cream. This is brilliant, my friend! I always avoid churros because they are fried. Don’t get me wrong… I like some fried foods a lot, but need to choose carefully! Now that I can bake churros, I am excited! And serving them with chocolate? Yes, please! Dear Colette, now that is a treat that is calling my name – my kids love waffles (well, who doesn’t?) and, of course, churros – so, to combine these two treats in such a delicious way sounds like a true winner of a recipe!!! Hope all is well with you and your lovely family! They’re evil. Pure evil. SO delicious!